The usual metabolic complications of acute lymphoblastic leukemia are hyperuricemia, hyperphosphatemia, hypocalcemia, hyperkalemia, and renal failure. Type B lactic acidosis (LA) is a rare and unusual metabolic complication which can present as the initial manifestation of acute lymphoblastic leukemia with less tumor burden and is reported to be of unfavorable prognosis. We report a case of a 2-year-old child with acute lymphoblastic leukemia who presented with LA as the initial manifestation. A 2-year-old male child presented with persistent fever for one month. On examination, the child was cachexic, pale, acidotic without lymphadenopathy or hepatosplenomegaly. Complete hemogram revealed hemoglobin of 8.7 g/dl, white blood cells of 2.3 × 109/L with lymphocytosis of 67% and platelets of 85 × 109/L. Biochemical parameters revealed blood glucose 96 mg/dl, urea 8 mg/dl, creatinine 0.3 mg/dl, sodium 136 mmol/L, potassium 3.6 mmol/L, chloride 104 mmol/L, and bicarbonate was 4 mmol/L. Arterial blood gas analysis revealed increased anion gap metabolic acidosis (pH 7.01, HCO34, base excess – 21, and lactate 13.5). Peripheral smear did not reveal any abnormal cells. In view of prolonged fever with pancytopenia, bone marrow aspirate examination was done, which disclosed the diagnosis of acute lymphoblastic leukemia. The child was started on hydration and allopurinol to prevent tumor lysis syndrome. He was transfused 15 ml/kg of packed red blood cells to maintain normal perfusion and was started on parenteral bicarbonate correction. The child was started on chemotherapy with Prednisolone, Vincristine, and L-asparaginase. 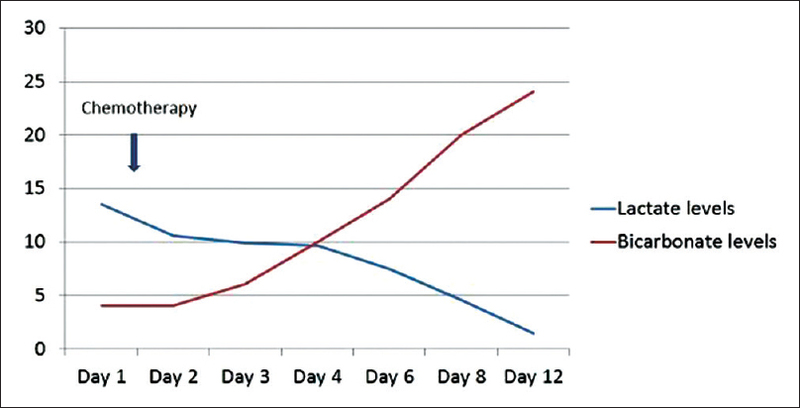 Lactate levels started decreasing and normalized (1.4) by day 8 of chemotherapy [Figure 1]. Child is on chemotherapy and doing well now. LA in malignancy is more common in adults and was first described by Field et al. in patients with acute leukemia in 1963. LA is usually due to the imbalance of lactic acid production and its clearance by liver and kidney. LA is defined as serum lactate levels >5 mmol/L and pH <7.30 and was categorized to Type A and B by Cohen and Woods in 1975. Type A is due to hypoxia and impaired perfusion. The common causes being septicemia, cardiac failure, shock with multiorgan dysfunction. Oxygenation and perfusion are usually normal in Type B LA and is caused by renal failure, hepatic failure, diabetes mellitus, malignancy, thiamine deficiency, drugs, and toxins affecting electron transport system and inborn errors of metabolism. Appropriate chemotherapy is the mainstay of treatment because this LA is usually refractory to alkali therapy alone., Alkali therapy needs monitoring for its complications such as carpopedal spasm and tetany, decreased cardiac contractility, and paradoxical production of intracellular lactic acid. Hemodialysis, peritoneal dialysis or continuous renal replacement therapy can also be used to eliminate lactic acid while the diagnosis is awaited. Prikis et al. reported a case of undiagnosed B cell lymphoma with severe LA in which large amounts of bicarbonate were administered, using sustained low-efficiency dialysis to correct acidosis. Ruiz et al. reviewed 31 cases report of type B LA secondary to malignancies from 2000 to 2010. Majority of the cases were hematological malignancy (87%) and only 19% of them were children. Although 18 patients received chemotherapy, only 5 patients had a favorable outcome. Six patients underwent dialysis, and only one had survived. Among the six children, only two had survived. LA with malignancy is reported to have poor prognosis. LA improves only when the malignancy responds to the chemotherapy. However, our child responded well to chemotherapy and doing well now. Unusual presentations detour the road to diagnosis and delay the appropriate treatment, leading to morbid or even fatal outcome. Although rare, children with acute lymphoblastic leukemia can present with LA without any of the features of usual clinical profile. Hence, when a child with LA and normal renal function is consulted by a nephrologist upfront, the possibility of malignancy is to be considered as one of the differential diagnoses. Gökçe M, Unal S, Gülsen H, Basaran O, Cetin M, Gümrük F, et al. A rare metabolic complication of acute lymphoblastic leukemia in childhood: Lactic acidosis. Turk J Pediatr 2012;54:61-3. Field M, Block JB, Rall DP. Lactic acidosis in acute leukemia. Clin Res 1963;11:193-7. Cohen RD, Woods HF. Clinical and Biochemical Aspects of Lactic Acidosis. Oxford English. Philadelphia: Blackwell Scientific Publications; 1976. Prikis M, Bhasin V, Young MP, Gennari FJ, Rimmer JM. Sustained low-efficiency dialysis as a treatment modality in a patient with lymphoma-associated lactic acidosis. Nephrol Dial Transplant 2007;22:2383-5. Ruiz JP, Singh AK, Hart P. Type B lactic acidosis secondary to malignancy: Case report, review of published cases, insights into pathogenesis, and prospects for therapy. ScientificWorldJournal 2011;11:1316-24.